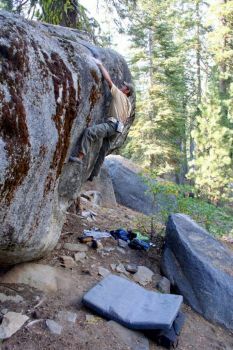 Coming from the west, these roadside boulders are the first you come to on CA-120. Most are found on Tamarack Flat Road and are only worth a stop if you just can’t wait any longer, you’re camping at the secluded Tamarack Flat Campground or it’s raining or snowing up in the Tuolumne Meadows area. Not that there aren’t a fair amount of problems here, but compared to how many are just 45 minutes away to the east around the Meadows it is just a pit stop. The rocks are also not as knobby as the Meadows, having more edges, buckets, cracks, and arêtes. There are also a few good problems in the campground at the bottom of the road and potential for more all over the Tamarack area. Some of the main developers of Tamarack since about 2001 are Robbie Hrabik and Aaron Brouwer. *Please keep this far out area (and everywhere in the great outdoors) clean and pristine and as always Leave No Trace. Hueco Mantel V0*** or V1*** sit + One Legged Bandicoot V2*** or V3*** sit + Piscean Way V!? Which SuperTopo guidebooks cover Tamarack Boulders? Peter Croft bouldering near the base of Crescent Arch, Daff Dome.